Let’s say you are looking to fill an entry-level job at your marketing agency. You might begin by posting the job to a local job search website and updating the open positions section of your company’s website. You may also engage the services of a recruiter to find qualified candidates. Whatever your specific recruitment path looks like, those interactions before, during, and after an employee is hired and begins working for an organization is known as the human resources life cycle. Beginning with recruitment, employees and employers enter the HR life cycle together, and both parties move through the different stages over the course of employment. A successful business treats the HR life cycle as more than a series of events—it’s an opportunity to attract the best talent and ensure all employees work well together to achieve personal and company goals. If your company wants to see those results, take a look at these five easy steps to make your human resources cycle more effective. Set your business or organization up for success from the beginning by attracting and hiring the right kind of employees. This process goes beyond simply evaluating a potential employee’s resume or prior experience—you should also consider factors like culture fit, potential for growth, and overall personality. If your company has the resources, you can even outsource your talent search to a specialist who can help you identify the best candidates. 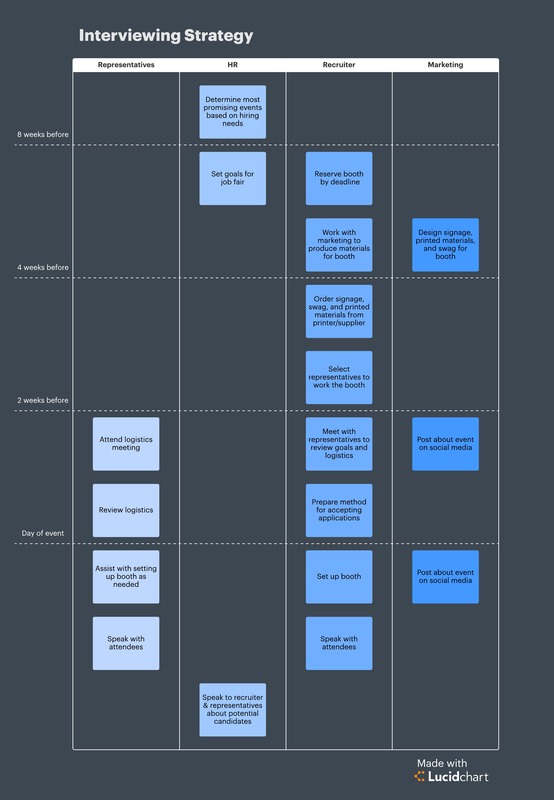 Set expectations early with detailed roles and responsibilities for open positions. Design an attractive compensation and benefit plan to engage top-tier talent. 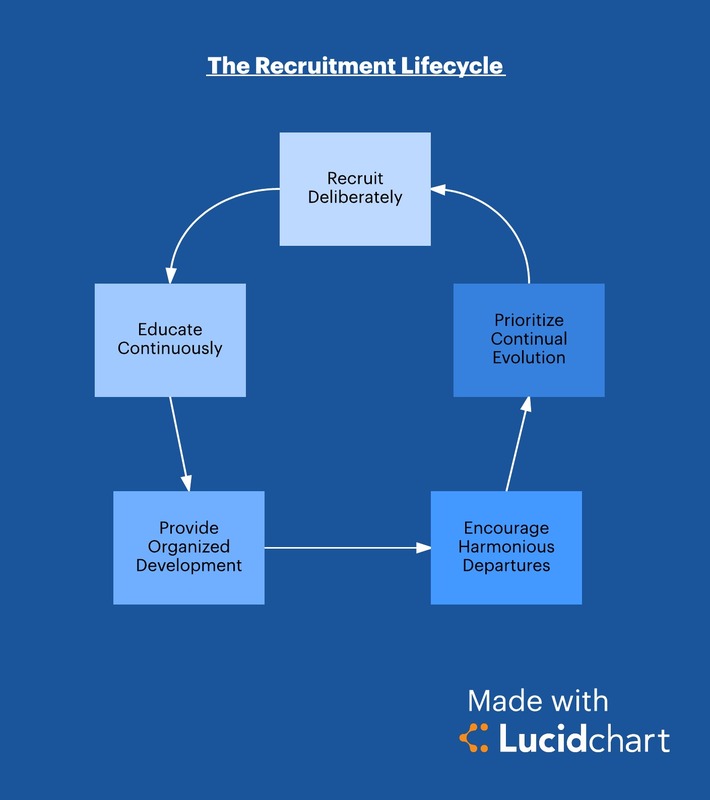 See how Lucidchart can help your human resources team build a recruitment process flowchart and stay organized in their search for the best job candidates. Once you’ve selected a candidate and extended an offer, you can help the new hire get up to speed on current projects and workflow. During this stage of the HR life cycle, the new employee learns their job responsibilities, begins to form relationships with their co-workers, and starts to find their place within the organization. Keeping an open line of communication all through the onboarding process allows for swifter integration and gives your organization a chance to make improvements when onboarding future new hires. A successful HR cycle also includes educating employees on the values and culture of the organization. If your business has a mission statement you uphold as a compass to guide and inform decisions, for instance, spend time explaining to your new hires how that statement influences the way the company works. Depending on an employee’s personal and professional goals, you may also want to identify seasoned employees to mentor the new hire. Promoting a feeling of continued growth and career development is essential in retaining dedicated employees. If done correctly, the education process of the HR life cycle will continue throughout each employee’s tenure at the company. 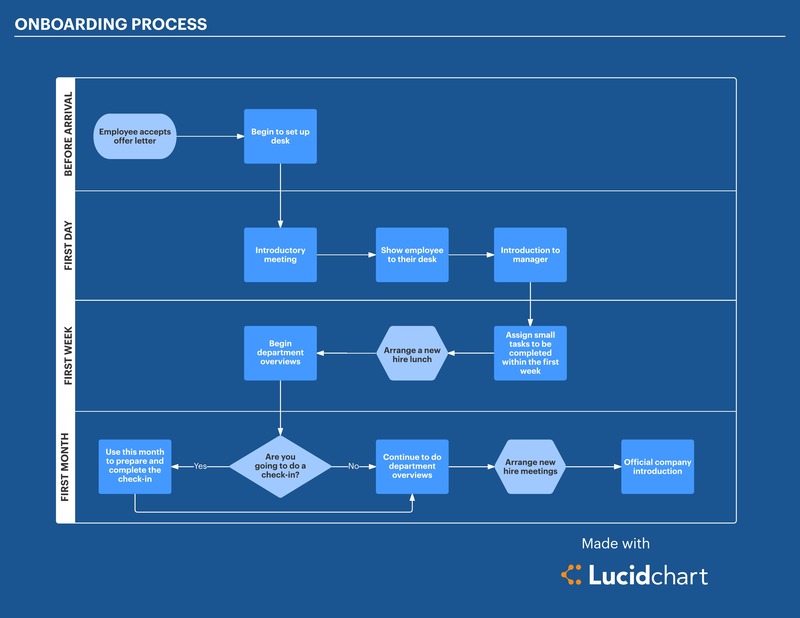 Use Lucidchart to ensure a hassle-free onboarding process for new employees. Check out this article to learn more. For some individuals, simply showing up and putting in the minimum effort is enough to keep them satisfied. But for a majority of people, feeling fulfilled requires a more nuanced approach. Employees want to know that an organization recognizes and values the time and effort they’ve invested—they want to work towards a larger goal. To that end, managers and HR team members should come up with ways to keep employees motivated, including outlining a plan for growth. 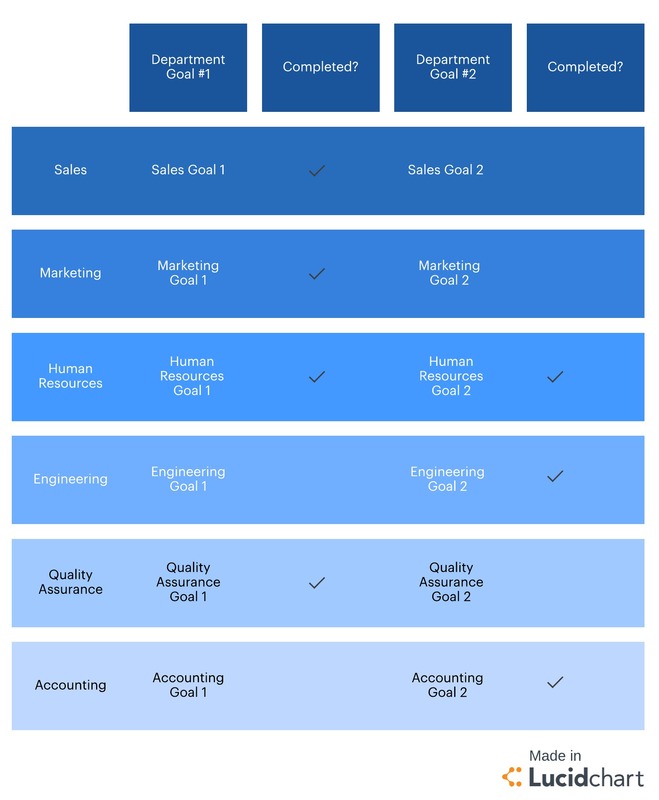 Create your own Lucidchart documents to explain and track your department’s goals. In addition to standard incentives like benefits and compensation, ask individual employees what makes a difference in their lives and how they like to be recognized for their contributions. Maybe they value the opportunity to travel to and participate in various industry conferences. Some might need the freedom of a flexible schedule to stay engaged. Soliciting constant feedback establishes open and honest collaboration, which moves everyone towards their desired goals. People leave jobs for many different reasons—some good, some bad. The HR life cycle ends when an employee resigns, retires, is terminated, or otherwise leaves the company. In most cases, both the employer and employee hope to close the relationship under harmonious circumstances. A great way to make that happen is to encourage open discussion about the employee’s experience with the company. Schedule an exit interview between the original hiring manager and the employee to discuss high and low points throughout the lifetime of employment. You can use information gleaned from those exit interviews to improve upon processes and make organizational changes. To improve the human resources life cycle, view it as an ever-changing series of events, making updates as needed as new issues and challenges arise. What works for one company may not work for another, and vice versa. A willingness to adapt the HR life cycle to the changing landscape is an invaluable attribute and should be a priority for hiring managers. The one constant in life is change, and this adage also applies to the human resources cycle. As industries evolve and focuses shift, successful businesses are the ones that rapidly respond and adapt to changes. What you are waiting for? Start refreshing your human resources team today with org chart templates from Lucidchart and improve the way you do business.